Hoorn, North Holland, The Netherlands. 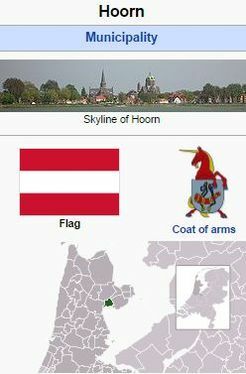 Hoorn, a Dutch city (coordinates: 52.64237, 5.06021 [52° 38′ 32″ N, 5° 3′ 36″ E]; 1947 population, 13,420, with 209 Mennonites; 2007 pop., 68,852) on the former Zuiderzee in the province of North Holland, is the seat of a Mennonite congregation. Little is known of its early history. No church records were kept until 1706, when the Waterlander congregation began one. Presumably there were advocates of adult baptism in Hoorn before 1550. The chronicler of Hoorn recorded that on 7 June 1535, five Anabaptists, including some women, were put to death on account of their faith. In 1542-1543 the Anabaptists of Hoorn organized a congregation, which was visited by Menno Simons on his journey through North Holland. The noted elder Leenaert Bouwens baptized 25 persons in 1551-1556. The congregation grew rapidly from the influx of refugees from the rest of Holland and Zeeland, among them many shippers and merchants. Leenaert Bouwens is said to have stopped here 12 times in 1556-1567 and to have baptized a total of 165 young people. In 1566, when the wave of iconoclasm broke out, the Catholic authorities passed very severe measures and limited the freedom of the Anabaptists in holding services. Unfortunately divisions were taking place here as elsewhere in the country. Tradition says that there were 13 different groups of Anabaptists in Hoorn. A deacon who was born in 1677 relates that at his time there were only six left. They had the following names: Frisian; Old Frisians or Jan Jacobsgezinden (after their founder Jan Jacobsz); Waterlanders (practiced feet washing); Flemish; High Germans; and "Plempschen" (probably so called because their church stood on a canal that had been filled [geplempst]; these "Plempschen" were also called the "Pieter Jansz Twisck gezinden" after their elder, P. J. Twisck; the Rijnsburger Collegiants (who had much in common with the Anabaptists and whose meetings were also attended by many Mennonites); the name "Robbertgezinde" also occurs, whose founder in 1590 was a teacher of sailing and a printer of books in Hoorn. Attempts to bring about a union had of course been made, at least by a few groups. In 1566 such an attempt was made by Jan Willemsz and Lubbert Gerritsz, elders of the Frisian and Flemish congregations. It failed and was repeated in 1576, again in vain. Union was not achieved until 1692. In 1724 the Pieter Jansz Twisck group or Old Frisians united with the Frisians. From then on, there were only two congregations—a Waterlander and a Frisian—whose relations were friendly. In 1698 the Waterlanders invited the Frisians to cooperate in merging their services, so that the members of both groups could attend services in both churches. This suggestion was rejected, but was successfully repeated in 1706. In 1723 a Frisian elder had charge of the worship of the Waterlander congregation. An attempt made in 1727 to unite the congregations failed, although the elders of both congregations were holding baptismal and communion services in both churches. On 17 December 1747, the two congregations were merged, with Jacob Fortuyn as preacher and Cornelis Ris as elder. Beginning in 1700 the membership had greatly receded, partly because the city was declining, and partly on account of indifference. Although the Frisian and Waterlander congregations had united, they kept their own churches until 1800, when there was danger that the less-used of the two would be used for military training purposes. The nonresistant Mennonites would have nothing to do with such a cause, and tore down their church. The remaining church, which belonged to the Frisians, stood until 1865, when it was replaced. The church, located at Ramen 31, was used until 1971. 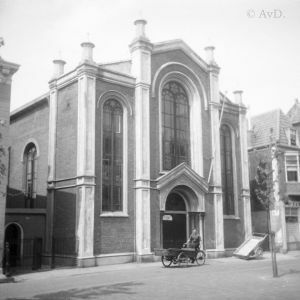 At that time, the congregation began to worship with the Remonstrant congregation (Remonstrantse Broederschap) in their church, located at Grote Oost 43. Formerly Hoorn was an important center of Mennonitism, both by its large membership and its influential leaders. Jan Willemsz and Lubbert Gerritsz of Hoorn were called to Harlingen in 1567 in a futile attempt to settle the conflict between the Frisian and the Flemish Mennonites; a large conference of North Holland leaders was held in Hoorn 1568, where the conduct of Dirk Philips, who had banned Willemsz and Gerritsz, was censured; in 1576 a number of elders and preachers of the Waterlanders met at Hoorn to make peace with the Frisians—a fruitless effort; a meeting of the principal leader of the Old Frisians, Pieter Jansz Twisck, elder at Hoorn, and some conservative Flemish leaders took place here in 1622. The Waterlander congregation of Hoorn was more conservative than Waterlander congregations usually were. It laid much stress upon confession and took measures to keep out of the pulpit the preachers from outside who sympathized with Collegiantism. After the congregation had united with the Frisians, its preachers published a booklet for the catechumens Vraagen over de Grondwaarheden des Christelijken Geloofs, . . . (Hoorn, 1768). Shortly before (1766) the elder of Hoorn, Cornelis Ris, had produced a Confession, approved by the Zonist Mennonite Conference. In the 18th century after the union of Waterlanders and Frisians the congregation was a member both of the Frisian Conference of North Holland and the Zonist Conference. Important preachers in that century were Pieter Beets, Peter Houttuyn, Willem Houttuyn, Adriaen Houttuyn, Jan Beets, Jacob Houttuyn, Cornelis Ris, and Jacob Spits, who was the last unsalaried minister of Hoorn. He died in 1810, at the age of 90 years. Notwithstanding these prominent preachers the membership declined considerably, both because of the decline of Hoorn as a trade and navigation center and also because of the indifference of the Mennonites to their brotherhood in the 18th century; during this century many Mennonites transferred their membership to the Reformed Church. About 1700 (figures of an earlier period were not available) the total number of (baptized) Mennonites in Hoorn was 500, in 1747, when the Frisians and Waterlanders united, it had decreased to 212 members, about 119 in 1840, 142 in 1900, 200 in 1931, 165 in 1954. The ministers during these 150 years were Jacob van Zaanen 1805-1813, Jacob Pol 1814-1843, J. G. de Hoop Scheffer 1843-1846, J. Kerbert 1846-1867, J. H. Uiterwijk 1867-1870, A. W. Wybrands 1870-1882, J. W. van der Linden 1883-1884, K. Gorter 1885-1889, J. Pottinga 1890-1893, M. Uiterdijk 1894-1932, B. P. de Vries 1933-1948, W. Broer 1949- . Since 1933 the pastor of Hoorn has also served at Enkhuisen. In 1952 a group left the main body of the congregation because of the rigorous orthodoxy of Pastor Broer. This group, 45 members in the 1950s, made contacts with the Beemster congregation; it held separate meetings and had a ladies' circle of its own. The Hoorn congregation, which was very wealthy in the 18th century, has since lost most of its means. Church activities in 1954 included a Sunday school for children since 1896, a ladies' circle, and a Bible group. Cate, Steven Blaupot ten. Geschiedenis der Doopsgezinden in Holland, Zeeland, Utrecht en Gelderland. Amsterdam: P.N. van Kampen, 1847: I and II, passim. Doopsgezinde Bijdragen (1861): 161; (1867): 58, 66, 77-90; (1873): 52 f.; (1879): 94; (1882): 116 f.; (1883): 72; (1892): 103 note 1; (1893): 37 f., 58 f., 61 f., 78, 81. Hege, Christian and Christian Neff. Mennonitisches Lexikon. Frankfurt & Weierhof: Hege; Karlsruhe: Schneider, 1913-1967: v. II, 344 f.
Hoop Scheffer, Jacob Gijsbert de. Inventaris der Archiefstukken berustende bij de Vereenigde Doopsgezinde Gemeente to Amsterdam. 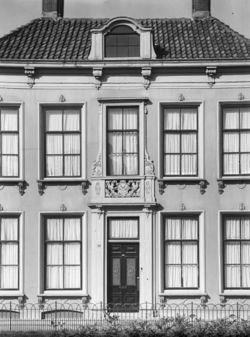 Amsterdam: Uitgegeven en ten geschenke aangeboden door den Kerkeraad dier Gemeente, 1883-1884: I, Nos. 131, 396, 480, 502, 531, 558, 708, 781, 868-72, 888, 1154, 1180, 1408, 1415; II, Nos. 1944-46; II, 2, Nos. 101-218. Slee, Jacob Cornelius van. De Rijnsburger Collegianten: geschiedkundig onderzoek. Utrecht: HES Publishers, 1980: 188-194. Uiterdijk, Menzo, Nanne van der Zijpp and Richard D. Thiessen. "Hoorn (Noord-Holland, Netherlands)." Global Anabaptist Mennonite Encyclopedia Online. October 2014. Web. 20 Apr 2019. http://gameo.org/index.php?title=Hoorn_(Noord-Holland,_Netherlands)&oldid=146490. Uiterdijk, Menzo, Nanne van der Zijpp and Richard D. Thiessen. (October 2014). Hoorn (Noord-Holland, Netherlands). Global Anabaptist Mennonite Encyclopedia Online. Retrieved 20 April 2019, from http://gameo.org/index.php?title=Hoorn_(Noord-Holland,_Netherlands)&oldid=146490. Adapted by permission of Herald Press, Harrisonburg, Virginia, from Mennonite Encyclopedia, Vol. 2, pp. 807-808. All rights reserved.